The Uzzell Family memorabilia collection, currently on loan to Exeter City Football Club, offers a particular example of a shared passion for collecting, spread across four generations of the same family. 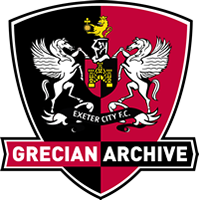 The collection, compiled by Edgar, Gerald, Phil and Devon Uzzell, shows how football memorabilia has evolved over the years, as well as revealing much about the history and heritage of ECFC. Through the Uzzell's collective records, we can observe that though the documentation of a family passion has changed across different media, a core component - love for the club - has always remained. This short exhibition was curated by students from the Performing Digital Humanities course at Exeter University in 2016 (Hayley Johns, Andrea Lindquist, Lucy Maguire, Abi Setchfield and Charlotte Tose) and uses a small sample of the Uzzell family collection to explore changes in football memorabilia across different media. It by no means offers an exhaustive analysis of the extraordinary variety of items in the Uzzell collection, but it presents an interpretation of the rich and fascinating material the collection holds. We would like to extend our thanks to the club, the Trust, especially Will Barrett and Martin Weiler, and most importantly the Uzzell family themselves, for their permission to create this exhibition and the extensive feedback they offered at various stages of the project.